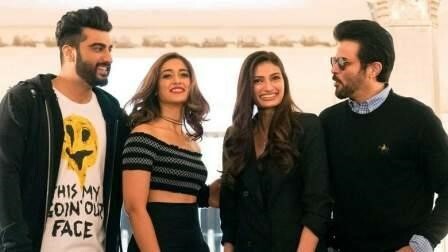 Mubarakan stars Anil Kapoor, Arjun Kapoor, Athiya Shetty and Ileana D' Cruz are coming to Dubai to celebrate IIFA this Sunday. The celebration will take place at night at Maha Ballroom, Hyatt Regency Dubai Creek Heights. The stars will promote their film and also present mementoes to IIFA Celebration sponsors. This will be followed by a screening of 2017 IIFA awards that took place in New York over a sit-down dinner. There will be an after party as well. Salman Khan, Shahid Kapoor, Varun Dhawan, Alia Bhatt, Katrina Kaif, Sushant Singh Rajput and Kriti Sanon performed at this year's IIFA Awards. Shahid Kapoor and Alia Bhatt won Best Actor awards for their remarkable work in Udta Punjab. The Best Picture honour went to the movie Neerja, which is based on the real life story of Neerja Bhanot, an air hostess who lost her life while trying to save others on a hijacked flight at Karachi Airport. IIFA has been in the news off late, because of the controversial comments made by Varun Dhawan, Karan Johar and Saif Ali Khan about nepotism.